Warmer — MumbleBee Inc MumbleBee Inc.
Deal of the Day: Save on the Instant Pot Duo Plus 6 Qt Programmable Pressure Cooker for 1/31/2019 only! Now is the time to grab your new 9-in-1 multi-use programmable Pressure Cooker, Slow Cooker, Rice Cooker, Yogurt Maker, Egg Cooker, Sauté, Steamer, Warmer, and Sterilizer for under$100! The possibilities are endless when it comes making something special and new in these beauties. I even had a blogger friend make wine in his! Yes, you heard that right I said wine. I’m not that creative in mine just yet, but enjoy cooking all types of recipes in ours. Deal of the Day: $79.99 & FREE Shipping. The Duo Plus is designed with a large blue LCD display with a new user interface to adjust the cooking settings, pressure levels, keep-warm on/off at any time during the cooking process. There are 4 new icons to easily view the status of the cooker, Heat, Pressure Cook, Keep Warm and Sound. The ‘Heat’ indicates heating or cooking in progress, ‘Pressure Cook’ indicates the pressure cook program is selected, ‘Keep Warm’ indicates if it is on/off, and ‘Sound’ indicates if the sound is on/off when cooking starts or is completed. NOTE: This product is 110v and for use in North America, if you live in Europe or other 220-240v territories this product will not operate. 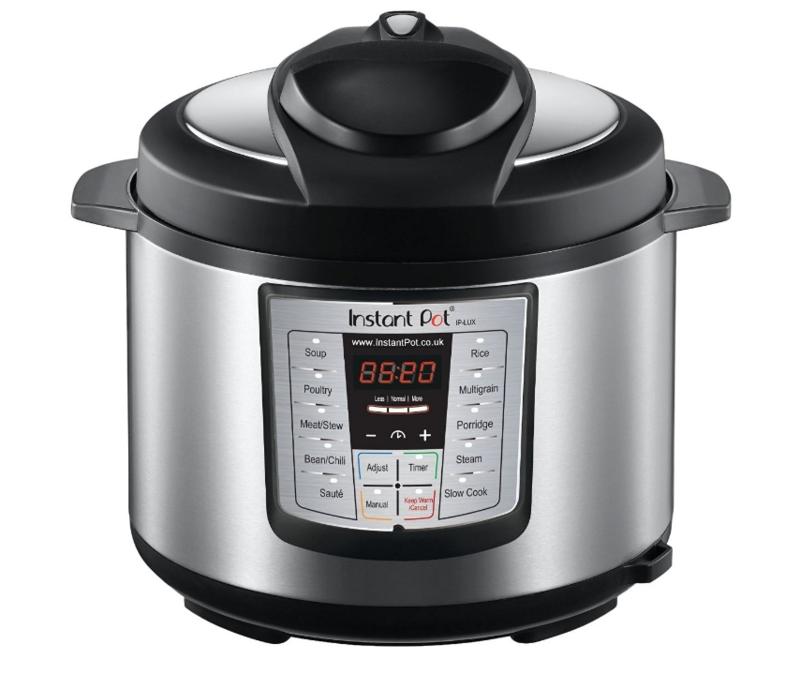 Deal of the Day: Save 31% on the 6 Qt Instant Pot Duo Plus DUO for 6/26/2018 only! Now is the time to grab your new Instant Pot Duo and all under $100! The possibilities are endless when it comes making something special and new in these beauties. I even had a blogger friend make wine in his! Yes, you heard that right I said wine. I’m not that creative in mine just yet, but enjoy cooking all types of recipes in ours. Deal of the Day: $89.99 & FREE Shipping. Instant Pot Duo Plus is the next evolution in the Duo Series, the #1 best-selling cooker in the Instant Pot family. The Duo Plus 9-in-1 Programmable kitchen appliance with advanced microprocessor technology incorporates all of the great features that made the Duo the #1 best-seller. It has new and improved programs and features to continually support one’s fast-paced, health-conscious and lifestyle. The Duo Plus includes 3 new programs, Cake, Egg, and Sterilize. The Cake program has been designed to pressure cook soft and moist cakes; whereas, the Egg program has been created to prepare perfect eggs in just a few minutes. With the Sterilize program one can pasteurize milk, and sterilize baby bottles, jars, and utensils; as well as, perform certain types of canning much more conveniently than ever before! Instant Pot is the next generation Electric Pressure Cooker designed by Canadians specifically for North American consumers. 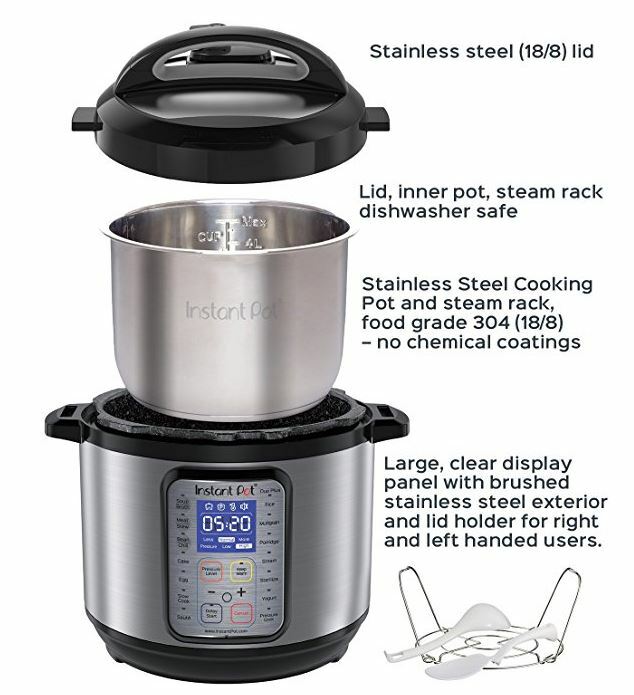 It speeds up cooking by 26 times using up to 70-percent less energy, and, above all, produces nutritious healthy food in a convenient and consistent fashion.Instant Pot IP-LUX60 is a 6-in-1 programmable cooker combining the functions of a pressure cooker, saute/browning, slow cooker, rice cooker, steamer and warmer. The latest 3rd Generation technology with an embedded microprocessor greatly improve cooking result, maintain consistence and enhance safety. Your favorite dishes are within the reach of pressing a button with 10 built-in programs and 3 adjustable modes. 3 temperatures in Saute for browning or thickening, and 3 temperatures in Slow Cook to complete the tasks of a common slow cooker. It also works as a perfect porridge maker allowing you wake up with a fresh made porridge.Instant Pot cuts the cooking time and energy consumption by up to 70-percent. It also preserves the nutrition and flavors in natural ingredients. Instant Pot produces almost no noise nor steam, and is truly a kitchen-friendly appliance. The stainless steel inner pot leaves no health concerns of non-stick coating residual. The brushed stainless steel exterior is finger print proof. Instant Pot is the must-have cooking appliance in your fast-paced, health-oriented and green-conscious life style. Instructions, Recipe and Cooking time table in English, Spanish, French and Chinese are included. Deal of the Day: $69.99 & FREE Shipping.